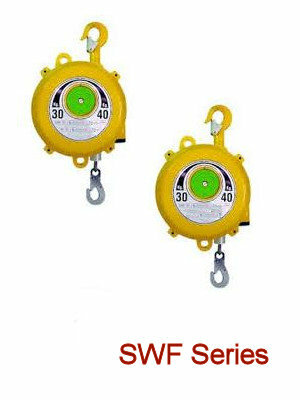 The SWF Series are the most versatile Spring Tool Balancers and is used throughout industry in many applications. We can supply these for simple light weight tool applications to large welding machines in car manufacturing plants. The use of spring balancers is endless and has proven to counteract the effects of fatigue on a workforce due to repartition. Length of travel comes in two options and most models can be supplied with 8ft of working travel. So from 0.5kg to 200 kg there is a model which will cover within this range. The SBH Series have been introduced to cover heavy weight balancers in the standard travel and the extended travel up to 3.0 meters. These balancers range from 85kg to 300kg with the shorter travel up to 1.5 meters. Since the spring tension reduces the effective weight of the suspended load to nearly zero, you can control it's vertical position effortlessly. Flexible operation is possible as stable balance can be achieved at any height. With a fully enclosed body these are some of the most robust and safe spring balancers available worldwide. 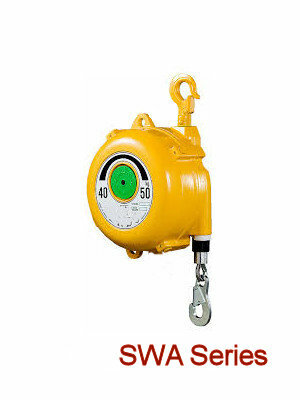 The SWA Series was developed to incorporate a safety feature not found on other balancers. These units are provided with a safety wire arrest mechanism and are primarily used with welding guns and applications where there is a chance of support wire failure or tool disengagement due to accidental failure are high. These balancers are available for capacities from 9kg to 70kg and have all the excellent features of the SWF Series. The advantages of spring balancers are a reduction in fatigue which in course improves work efficiency. 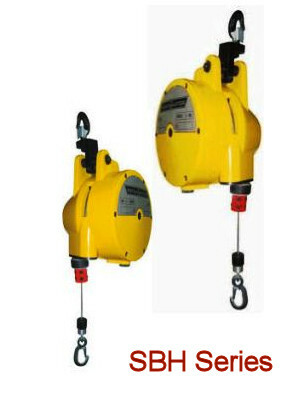 The mounting or suspending of the spring balancer is achieved by the top spring hook. Balancers can also be mounted upside down but one must then take into consideration the weigh of the balancer when making calculations. To allow free movement of the unit we supply beam trolleys in 4 different weight categories depending on the weight being balanced. These units are made from high grade alloy steel plate and feature a self aligning frame and ball bearing wheels that roll smoothly along beams for efficient material handling. Spring balancers are held in stock in three major distribution hubs, Canada, India and the Middle east. If one does not hold a particular unit then we source from the other two with shipping by air taking only 3-4 days. 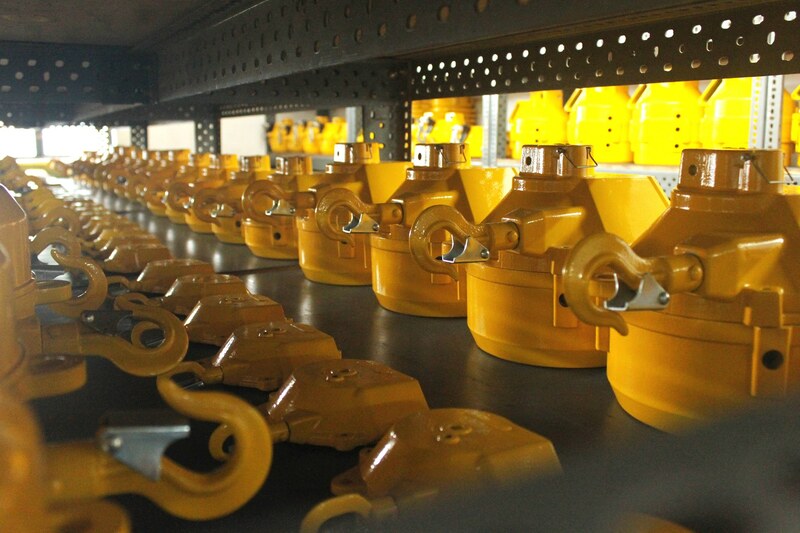 Within our manufacturing plant we can make balancers to your individual needs and custom them to your requirements. However, limitations are based on length of travel due to the standard drum size of a balancer. The Powermaster name is a name which has always been connected to quality of product and service. We provide our customers with a product which can be found in many of the worlds manufacturing plants from suspending welding machines to the smallest of pneumatic tools required. These are car manufacturing facilities to large meat processing plants. Maintenance on our balancers is very limited to just keeping the unit clean. And, if a problem should arise new springs and wire ropes are always available for in-house service or be returned to out Ontario facility for full service requirements. Always call for pricing be it for a single balancer or multiple units. We will always be able to give you fair and honest price as we are the manufacturer. Our pricing is based on the USD$ so pricing to Canadian companies can fluctuate with the value of the CDN$. However once a price is firm we stand by it. 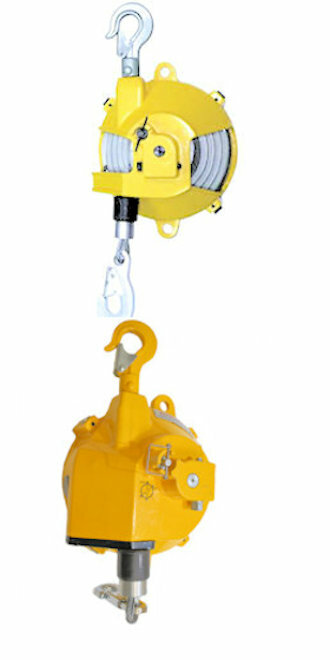 Within the boiler and heat transfer industries, spring balancers protect maintenance crews from the effects of fatigue caused by repetition lifting of heavy equipment, like the semi automatic tube puller as seen above. Also, when the equipment is idle it can be pushed aloft out of the way. 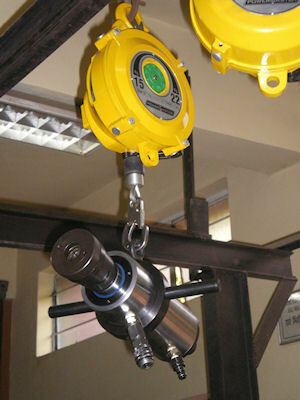 This gets rid of a trip hazard on the floor and also protects the unit by it being suspended high above the work area. The two balancers above show the design flaws in the top unit with the spool exposed where operators fingers can be trapped and the ingress of dirt is obvious. The Powermaster unit in the bottom of the picture is fully enclosed giving a safe mechanism and reliable by keeping the inner workings of the unit dirt and dust free.